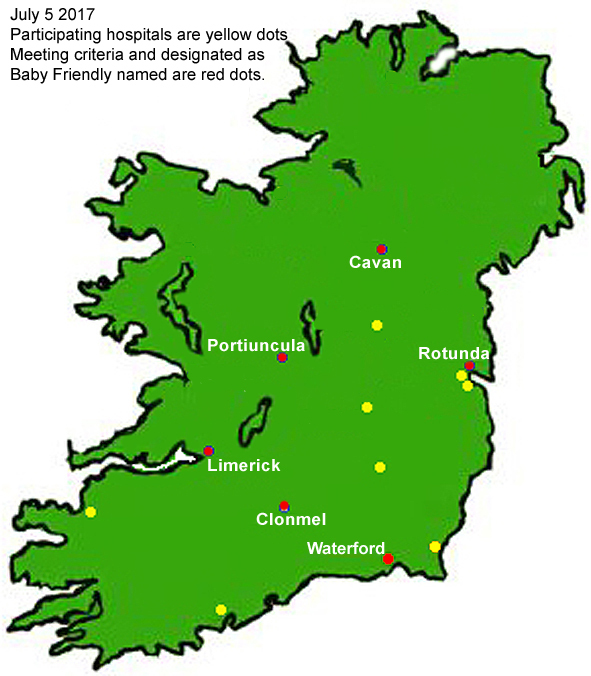 There are 19 Maternity units/hospitals in Ireland. Parents and other interested persons are encouraged to check the awards or certificates that are on display in your hospital are in-date. If an out of date award or certificate is on display ask the hospital why. The Baby Friendly Health (Hospital) Initiative in Ireland is an independent organisation and the national authority for awards under the UNICEF and WHO global Baby Friendly Hospital Initiative. What does Baby Friendly Status mean? Reassessment Process Below standard care? CERTIFICATE OF COMMITMENT What does Certificate of Commitment mean? PARTICIPATION LEVEL (Membership) What does Participation Level mean? This initiative came to Ireland in 1998 when the BFHI in Ireland began it was a part of the Health Promoting Hospitals Network programme and adopted a Health Promotion “Settings” approach to provide an environment that makes the healthy behaviour the easy behaviour and protects from promotion of less healthy behaviours. The first Irish hospitals to reach Baby Friendly standard were Portiuncula Hospital, Ballinasloe, Co. Galway and Waterford Regional Hospital. The award were presented at the EU Breastfeeding Promotion Conference on 18 June 2004, in Dublin Castle, by Minister for Health and Children, Mr Micheál Martin. This was an event during the term of Ireland’s Presidency of the EU. View picture and Press Release. St Munchin's Regional Maternity Hospital, Limerick (now University Hospital) became the third hospital to reach this standard in October 2004. 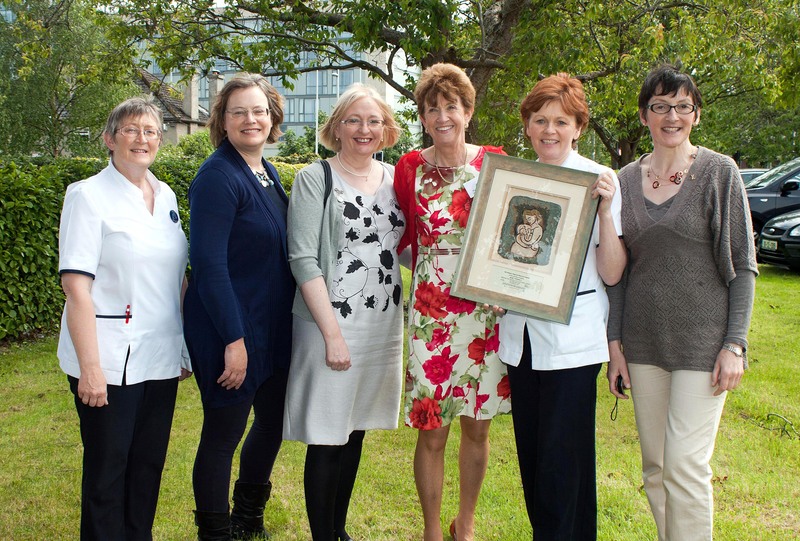 St Munchin's Hospital is Ireland's first midwifery teaching hospital to meet the BFHI criteria. 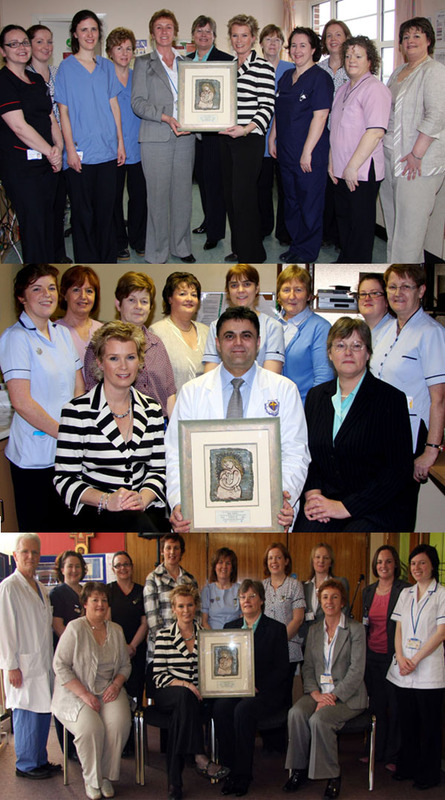 View picture and Press Release St Munchin's Regional Maternity Hospital maintained supportive practices and following re-assessment achieved re-designation in 2011 View picture and 2016 (now University Maternity Hospital Limerick) as a Baby Friendly Hospital (National Award) View picture. 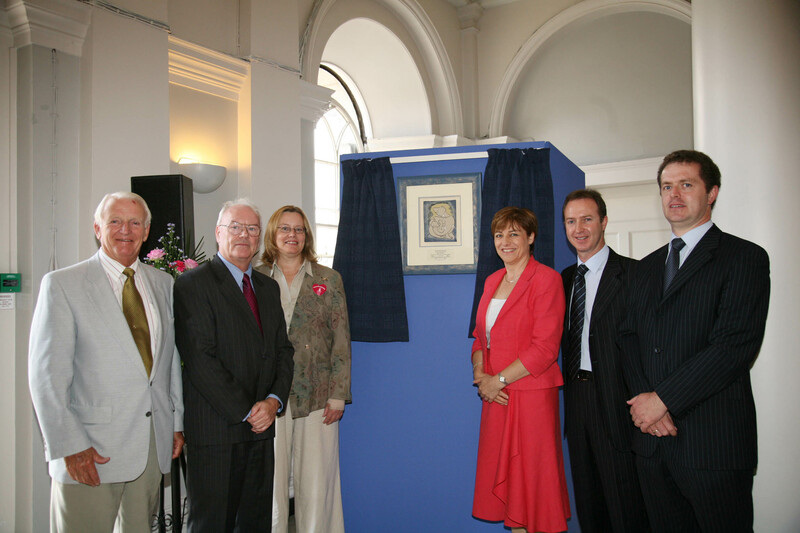 The Rotunda Hospital, Dublin and the Maternity Services of University College Hospital, Galway met the criteria and their awards were presented on June 14, 2006. View picture and Press Release. 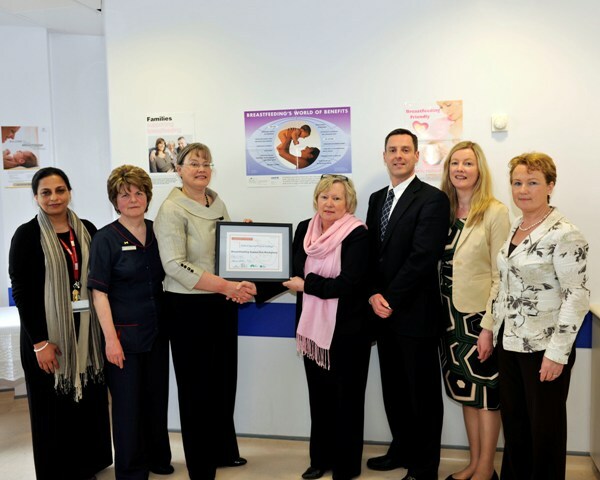 Both hospitals maintained supportive practices and following re-assessment achieved re-designation in July and May 2012 as a Baby Friendly Hospital (National Award) View 2012 photo The Maternity Services of University College Hospital, Galway designation lapsed in 2017. 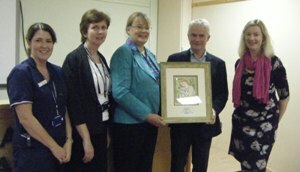 Our Lady of Lourdes Hospital, Drogheda met the criteria and their Baby-friendly award and Breastfeeding Supportive Workplace Silver Award were presented on October 2, 2007 by Mr Pat The Cope Gallagher,TD, Minister of State for Health Promotion, Depratment of Health and Children, and following re-assessment achieved re-designation in 2013. View Picture and Press Release 2007 and 2013. This designation lapsed in 2017. The Midland Regional Hospital at Mullingar (view picture) and the Midland Regional Hospital at Portlaoise (view picture) met the criteria and their Baby-friendly award and Breastfeeding Supportive Workplace Bronze Awards were presented in April and in May 2012. The designation for both hospitals lapsed in 2017. University Hospital Waterford again met the criteria and their Baby-friendly award was presented on June 20th 2017. View pictures. Reaching this standard also meant that all the clinical placement hospitals for University of Limerick maternity students hold designation as a Baby Friendly Hospital.